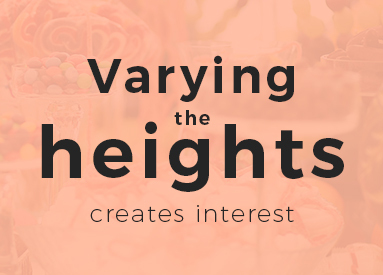 A candy buffet is a wedding element you can easily do on your own, but it does require some planning to pull off a coordinated look with enough candy to satisfy the sweet tooth of each guest. Check out our candy bar ideas to put together your own amazing display of sweet treats for your wedding guests. A DIY candy bar is simple to create, but you do need a few specific supplies to make the sweet buffet run smoothly. Many of the supplies are relatively inexpensive, but the finished design makes a big impression on guests. Containers: Clear glass containers let the colorful candies add a decorative look to the display. Choose an assortment of container sizes and shapes. Save money by gathering up any glass containers you already have. Bowls, clean vases, mason jars, even large drinking glasses work. Candy: It goes without saying, but you’ll need boatloads of candy to keep your wedding guests on a sugar high. Choose colorful candy that coordinates with your overall wedding design. Scoops: You don’t want guests to reach in with bare hands to grab their sweet treats. Supply assorted scoops, spoons and tongs based on the type of candy. Choose serving utensils that are small enough to fit into the containers yet large enough to retrieve the candy. Take-Home Containers: Some guests may munch on the wedding candy at the event, but others want to take the candy home as a party favor. Provide cellophane bags or small decorative boxes as containers. Don’t make them too large, or you’ll go through your candy supply quickly. Add a personal touch by attaching a thank you note to the take-home containers. Signs: Some candies are easy to identify. Others leave guests playing candy roulette, wondering what they might discover. To clear up any confusion, display signs near each bowl of candy. This also comes in handy for people who have food allergies, or need to avoid a particular type of candy for any other reason. Simple cardboard tents or chalkboard-style labels work well. Decorations: Colorful candy makes the table pretty, but additional decorations knock the display out of the park. Use a tablecloth as a backdrop for the candy display. Add garlands along the edge and confetti or other tabletop decorations. It’s tempting to start loading up on candy now, but don’t indulge in a sugar rush just yet. Having a clear plan on how to make a candy buffet results in a polished, beautiful display that will make all your guests drool. With your theme in mind, start planning the details of the candy bar. One key element is the location of the candy buffet. 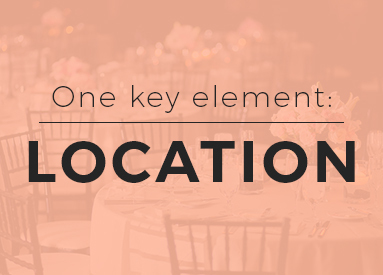 Choose a location that is easily accessible yet out of the way. Candy buffets are often located near other desserts and food tables. Leave enough space around the table to allow for a good traffic flow. The shape of the table is another consideration. A round table encourages guests to choose candy from all sides, while a rectangular table works well if you want to push the candy buffet against a wall. Determine if you will have the candy buffet open all night or just for a portion of the evening. If you let guests munch on sweets from the time they arrive, you may find your supplies low by the end of the evening. Holding off until the end of dinner or the end of the reception creates a more controlled environment. Simply post a kindly worded sign letting guests know when the candy buffet opens. The candy itself plays the starring role in your DIY wedding candy bar, so take some time to choose the candy carefully. When you think about how to prepare a candy bar, you need to determine the amount of candy necessary to keep your guests happy. If you get too little candy, many guests may leave empty-handed. Order too much, and you’ll have more leftovers than you could possibly use. A general rule of thumb is to supply around ¼ to ½ pound of candy for each guest. That translates to 25 to 50 pounds of candy for every 100 guests. This takes into account the people who might take a little more and the guests who will take less. The size of your take-home containers may influence this amount. Expect guests to fill the containers to the top. Stock extra candy for the buffet if you plan to provide large take-home containers. Another consideration is the size of your serving containers. If you have a huge apothecary jar and you’re filling it with M&Ms, you’ll need a lot to make the jar look full and pretty. For this reason, smaller containers that an attendant refills throughout the night often look better on the table. You’re ready to choose your candy. Let the fun begin! The great thing about a DIY candy bar for wedding guests is that anything goes, so have fun picking your favorite candies. Choose Colors: Candy comes in almost any color, so it’s easy to customize your buffet to fit the color scheme of your wedding. Choosing two or three coordinating colors for your candy selection creates a fun look, but remember, anything goes. Don’t let color stop you from including candies you really want to serve. If you want more than a few colors, stick with the same general type of color. For example, choose an assortment of pastels. You can buy many candies that come in lots of different colors in single color packages. This allows you to easily stick with your wedding color scheme across many different types of candy. Offer Variety: Think about your favorite candy. Does your partner share the same preferences? What about your best friend, parents and future in-laws? Everyone has a different taste in candy, so serving up a variety is a must. 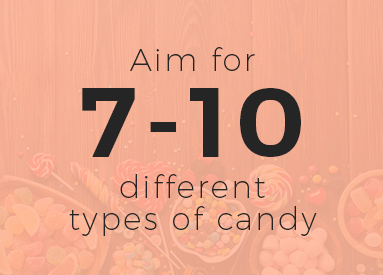 Aim for 7 to 10 different types of candy. Include different flavors, textures, sizes and types of candies. Not only does the variety keep your guest happy, it also creates a coordinated yet contrasting look to make your candy buffet interesting. Account for Allergies: It’s tough to accommodate every guest’s dietary restrictions or allergies, especially if you don’t know about them. Instead of trying to eliminate any potential problems, simply offer a variety of options, such as gluten-free, peanut-free, sugar-free and vegan options. Label those candies clearly so guests know which options are safe. If you know someone on your guest list has a life-threatening food allergy, consider skipping that food completely to remove the risk. Think Seasonal: Certain times of year beg for seasonally flavored candies. Of course, you don’t have to supply only pumpkin-flavored candies and candy corn for your fall wedding. That would go against the variety rule. Seasonal candies can give your candy bar a fun themed feel, though. Consider the Location: The location and the environment play a role in choosing candy. Chocolate candies melt if they don’t stay cool. Avoid any type of candy that melts easily, especially if the reception venue may be hot. In other words, if your reception is outdoors in July, skip the chocolates and soft candies, which will turn into a gooey, sticky mess. Hard candies tend to hold up better in warm conditions, but they still may melt or get sticky. Represent Yourself: Don’t forget to include your favorite candy and the favorites of your partner. Expand the favorites theme by asking each member of the wedding party to suggest a favorite candy. It’s a fun way to add a personal touch to the candy buffet. Plan Ahead: Know what type of candies you want to include so you can order them in plenty of time for the wedding. Some specialty candies may take time for the manufacturing and shipping process. While you should know how much and what types of candy you want, you also don’t want to order too far in advance, as the candy might seem stale. Aim for buying the candy 3 to 4 weeks before the wedding. Store it in a cool, dry, dark location until the wedding to keep it as fresh as possible. Chocolate can go in the refrigerator to prevent melting. Because the candy bar idea is flexible, you can weave in other goodies to shake things up. Nuts, cookies, chocolate-dipped fruit, mini cupcakes, cake balls and other small snacks work well to round out the candy offerings on the table. The containers serve a key role in your candy bar. They not only hold the candy, they become a part of the décor on the table. For this reason, you should choose containers that are pretty and fitting for your theme. Glass containers are popular because they let the candy show. Size: The containers should be large enough to hold an ample supply of candy, yet not so large that they look empty unless they have 20 pounds of candy in them. When estimating sizes and amounts of candy, consider that it takes about 5 pounds of candy to fill a 1-gallon container. That may vary somewhat depending on the size of the candy. Opt for smaller bowls for your smaller candy with a few larger containers for bigger candy. Shape: The shape affects how well the candy fits inside the container. If you have tall lollipops or other tall candy, choose a tall and narrow container. This helps the candy stay upright. For small bulk candy, avoid an extra tall container. Once the contents get low, guests will have difficulty reaching the scoop to the bottom of the tall container. Opening: Look for containers with wide openings so guests can easily scoop out the candy. A narrow neck might look interesting, but guests will fumble when trying to get the candy. Lidded containers look nice and protect the candy, but taking the lids on and off can be cumbersome. Variety: Just like the candy itself, you want a variety of containers to hold your goodies. Choose different shapes, sizes and designs. This draws attention when displayed on the table. Glass containers aren’t the only options for candy bar containers. Trays and cake stands offer a different way to display candies. Place gourmet chocolates or wrapped candies on the trays for a fun display. Find letter-shaped dishes to spell out the word “Love” or your initials. For a rustic wedding, fill metal buckets with candy. A cloth liner keeps unwrapped candies clean. Wicker baskets also work well for wrapped candies. Instead of spending a lot of money, dig through your cupboards to see what kind of containers you already have that might work. A dollar store is good place to score inexpensive glass containers if your own kitchen leaves you short on containers. Other container store options include restaurant supply stores, secondhand stores, discount retailers and craft stores. Several items need to fit on the candy bar table while leaving enough room for guests to reach and fill their bags. Having an arrangement plan saves you time and stress on your wedding day. When arranging your wedding candy bar, consider the different elements and how they play off each other. A varied display often looks better than uniform lines or rows of candy bowls. Put containers of different heights next to one another. Offset the positioning of the containers so they don’t look like soldiers in a row. Place boxes, books or other items on the table to elevate some of the containers for more pronounced height differences. Place a tablecloth or pieces of fabric over the entire display to hide the props that add height. Position some containers on the boxes and others directly on the table to create attention-grabbing height variations. When arranging the containers, consider how well guests can reach. Positioning most of the containers toward the front of the table allows guests to reach everything easily. While varying the heights creates interest, it makes sense to put most of the taller containers toward the back with the shorter containers in front. This keeps everything visible and makes it easier for guests to dig in and reach the candy. Place the take-home containers where they are easily accessible. Offer containers in multiple spots if guests can approach the table from any side. Arrange boxes in neat, short stacks to conserve space. If you’re using bags, place them inside a small basket or similar container to keep them neat and organized. Don’t forget ribbons or twist ties to use as closures! One of the best ways to determine your arrangement is to do a dry run. Find a table or countertop approximately the same size as the actual table you will use at the wedding. Gather all of your containers and decorations, including your tablecloth. Try out several different arrangements of the containers. Grab some friends to help you decide on an arrangement. If you find one you like, snap a photo so you can recreate it at the wedding reception. If you don’t have the time or space to do a dry run, sketch out your candy buffet before your wedding day. Draw in the different containers and items that will go on the table so you have an idea of how it will fit together. Start with a backdrop behind the candy bar to draw attention to the sweet treats. Large pieces of fabric, gathered tulle, burlap or similar materials work well to cover the wall. Dress up the background material with fun decorations that coordinate with other reception décor. Ideas include garland, banners, strings of lights, photos of the happy couple or artwork. 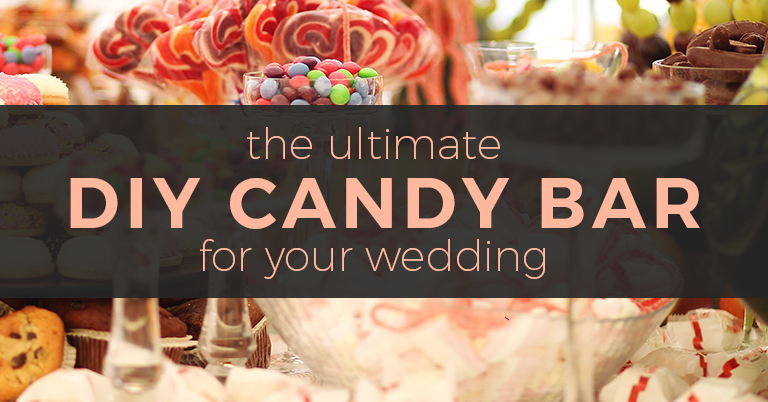 If your wedding candy buffet needs something extra, consider adding more decorations. 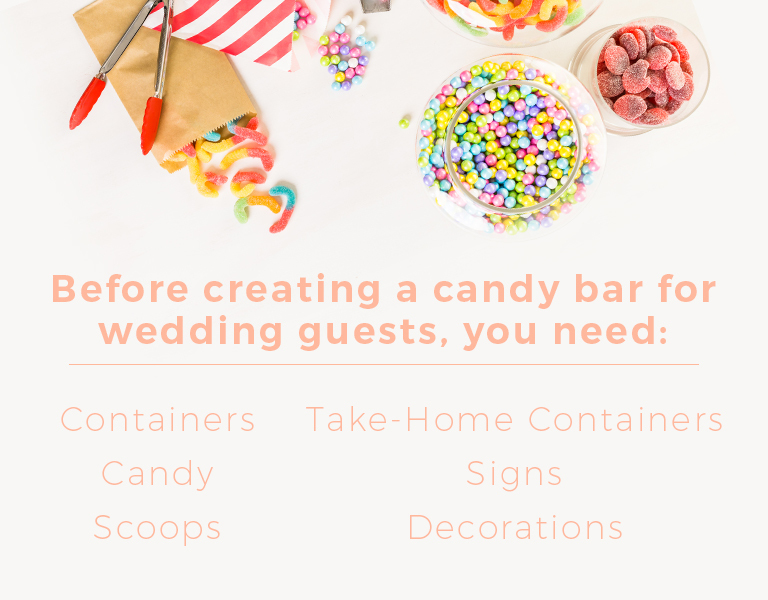 Choose items related to your theme to help the candy buffet fit with the rest of the reception. Don’t add too many decorations. They can quickly take over the whole setup, making it seem cluttered and letting the candy get lost in the shuffle. Another option is to carry the general table décor to your candy bar. Use some of the same centerpieces from the guest tables on the sweet buffet. This ties the look together with the rest of the reception décor. The candy buffet looks beautiful. Sparkling wrappers, shiny candies and whimsical lollipops fill the table. Nevertheless, how do you keep the table looking great once your guests start digging in to the sweet treats? A candy buffet attendant is a simple way to keep things running smoothly. Work with your reception venue or caterer to determine if they can supply a staff member to monitor the candy bar. You can also enlist the help of a friend or relative to handle the job. Is your sweet tooth itching for sugary confections to make your wedding special? At Warrell, we have a wide range of candy capabilities, including chocolate enrobing, chocolate panning, caramels, brittles and taffy. Find out more about our products and how they fit in with your wedding candy bar ideas.